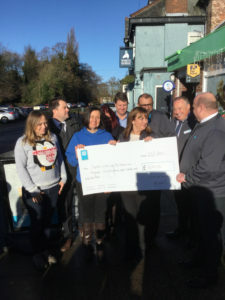 Last Saturday, representatives from the staff and committee of Poppleton Under Fives attended the Poppleton Co-op store on the Green to receive a fantastic cheque from the supermarket. We were delighted and so grateful to be a nominated charity, receiving funds raised by the staff and customers of three local Co-op stores which amounted to over £1800.00. On the same day, the chocolate tombola stall at Poppleton – Ousebank Primary School Fair raised approximately £250.00. We had a fantastic response from parents who donated the chocolate as well as some enthusiastic and generous customers, so thank you so much to everyone who supported us. The money raised will go towards consolidating and improving resources for Pre-School and Popp ’n’ Play and allow us to keep providing quality childcare and learning for all of our children.